Place one pizzelle on a paper plate and microwave for about 30 seconds, or until soft enough to shape. Working quickly pinch the pizzelle circle in 3 places equidistant from each other, so that you have formed a triangle shape, making sure to leave some space in the center of the triangle to pipe the fillings. Repeat this process of shaping the pizzelle into as many triangles as you like. One 7-ounce package will yield as many as 42 triangles. Prepare two disposable pastry bags (you can use baggies as a substitute) with two pastry tubes with ¼” round openings. Place some the marshmallow cream in one of the pastry bags and place some of the Nutella in the other pastry bag. Pipe some of the marshmallow cream or fluff inside the bottom third of the pizzelle triangle opening. Then pipe some of the Nutella on top of the marshmallow cream or fluff so that the triangle opening is filled slightly over the top. 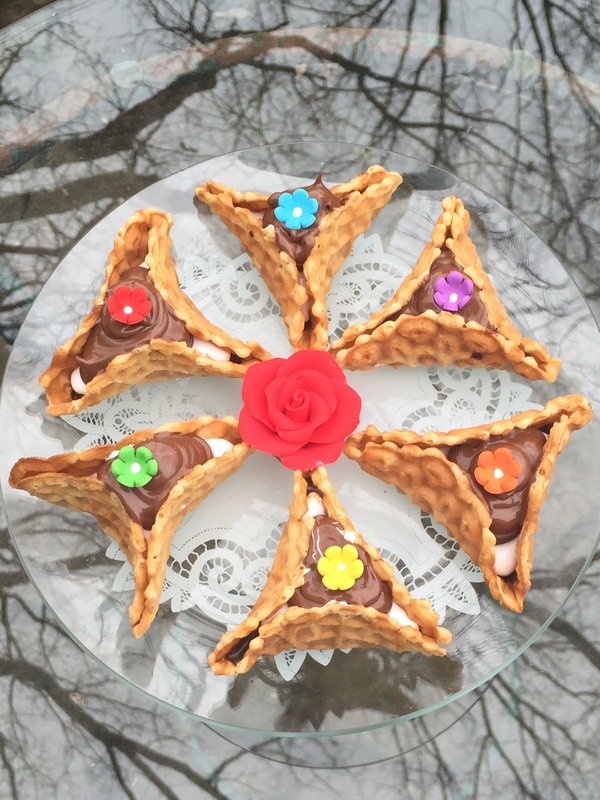 Repeat this process until you have as many of the triangular Hamantaschen pizzelle as needed. Garnish with your choice of sprinkles, icing flowers and/or confectioner’s sugar.